Hi everyone and welcome to my new followers. At last we have a nice day with blue skies and sunshine albeit a little chilly. Sadly it isn't forecast to last but it's nice to have a little respite from the rain. Today I have two new cards with very different themes. 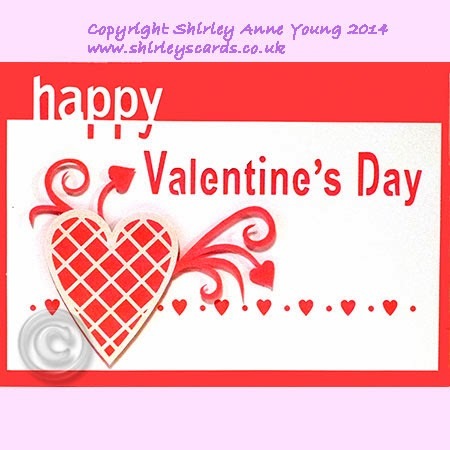 The first one is for Valentines day with the cut out front panel attached to a coloured card base. The 2nd one is a wobble card with two little cats which are paper pieced to give the two colour effect. The templates are available on my website and I am just finishing off another little freebie for you which I will post later. Our weather is atrocious, rain hail 50 mile an hour gusts, AND DARK. ugh! Love the fun paw print background on the cute wobble card! Thanks. I discovered your blog today. Your creations are so cute and well designed. Congratulations and thank you for sharing your work with other crafters !